You’d think by now I would have learnt my lesson regarding taking photos of my baked goods but nope – I still tend to bake then serve the item to friends before I’ve had a chance to take any photos. I made this for a recent gathering of friends and managed to snap a few pics before it was cooked. Afterwards was a blur of people almost charging each other over in order to get a slice. As this desert is so rich a teeny sliver goes a long way. I do also have a box of the legendary graham crackers which this recipe called for but decided to keep these for another day. I used plain sweet bickies so didn’t need the sugar as called for in the original recipe used. I also reduced the amount of sugar in the brownie as I knew the marshmallows would make the pie very sweet. In any case this was such a hit that I reckon I’ll be called upon again to serve this delish creation. Place biscuits in bowl of food processor and wizz until it looks like big crumbs. Add butter and combine until it resembles wet sand. Press into a glass pie dish and place in fridge while you prepare the brownie filling. Melt butter, sugar and cocoa in a microwave-safe bowl for 30 seconds at a time until melted and smooth when stirred. It will look gritty. Allow to cool for a few minutes. Stir in vanilla, then eggs, one at a time. Add flour, gently stirring, until fully incorporated. Ensure you don’t overbeat. Tip into pie crust and use a spatula to level the top. 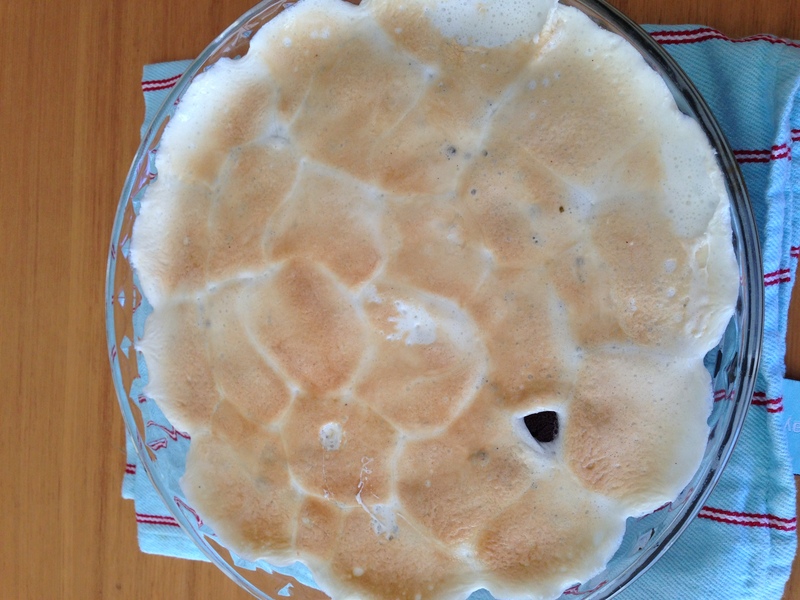 Bake for about 25 minutes, then remove from oven and neatly decoare the top with marshmallows. Bake for a nother two minutes but watch closely to ensure it doesn’t burn. From the ingredients, I think it tastes very delicious! Oh wow, this sounds so yummy!! I want some! Is pretty delish! I reckon you should make one! My goodness, I wish I had been at your dinner party, too! I would definitely have been in that crowd diving in to grab a slice of this! There’s no mucking around with our friends – when dessert is served it is survival of the fittest! I just need to get more organised with my baking/serving so I can get a decent photo or two! I often have the best of intentions to get that damn picture but then it all falls down in a screaming heap when people start jostling for dessert! What can look great is the “after” shot……ie when you take a picture of the item after its had a few slices taken out….or keep a portion back to “style” when you have more time. Ahh, good idea! I’ll have to remember to smuggle away a slice of cake or pie next time & hide it from the hungry family so I can get a decent shot. Thanks! LOVE IT! You had me at your title 😉 And the pie reminds me a bit of this, haha. http://wp.me/p2dvv9-gg Love those big ‘mallows, too. I love every single word in the recipe title! This looks so perfect and decadent. oh my goodness, my teeth ache with the thought of all that sweetness!! Sounds so simple and easy though! It is a sugar-esque dish and to be honest it is a bit too sweet for me. But judging by the way everyone else inhaled it no-one seemed to mind the sugar hit! Oh yes oh yes oh yes. Seriously want a slice of that delicious pie now! Cheers! It is a yummo treat. It is delicious but super dooper sweet! I am am sucker for caramelized marshmallow! Looks so good! Isn’t it amazing some of the products you can buy in the US that aren’t offered here in Australia (like Marshmallow fluff). On the other hand, they don’t have personalised butcher shops in the US, like they do here and it’s not too easy to find fresh duck. I remember we used to make S’mores when we went away to camp- we would place some marshmallows and chocolate pieces in-between two graham crackers and then warm them over a camp fire. Glad to see your version is a bit easier to make (i.e. no camp fire is required)! Your blog is beautiful! I love the photography and lovely little recipes. Happy baking! holy moly this looks insanely delish! not sure if you have a harris farm near you but they sell mega sized marshmallows! Nope, no harris farms in my neck of the woods #DamnSuburbs but I will SEARCH THEM OUT. I need all the marshmallows. Fabulous! My five year old is mildly obsessed with smores (or at least the idea of them). I will have to make this pie! Your 5 year old has great taste 🙂 This is so easy even kids could help make it. Oh my goodness! Looks SO great! 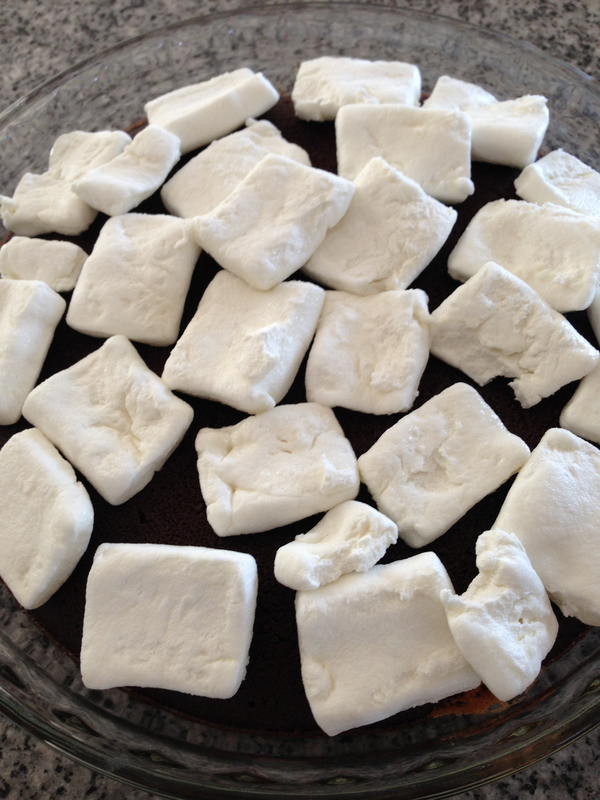 My little one loves “marshmallellows” as she calls them, so we try to find fun recipes to make with them. And being in Canada, we can always find them 🙂 Thanks for this one! Oh my goodness! You have a great blog. Awww, ta 🙂 Am somewhat obsessed with baking!